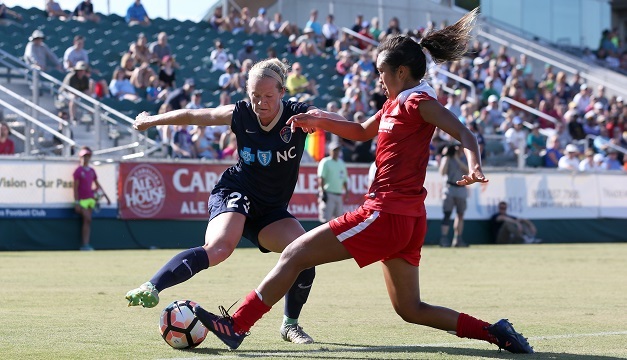 Cary, N.C. (August 19, 2017) – The Washington Spirit visited the league-leading North Carolina Courage on Saturday in the NWSL on Lifetime Game of the Week, falling 2-0 with both of Carolina’s goals coming in the second half. After a scoreless first half featuring strong defense by both sides, with the Spirit limiting the Courage to just one on-target shot, the home side took the lead less than one minute into the second half. Courage midfielder Ashley Hatch placed a shot into the bottom left side of the net, scoring on an assist from Kristen Hamilton. Carolina’s second score came on a Spirit own goal following a deflection hitting Kassey Kallman off a Courage corner kick sent in by U.S. international Sam Mewis. The Spirit’s two closest scoring chances of the game occurred at the end of each half, starting in the 44th minute when defender Estelle Johnson fired a shot on its way to the inside of the right post, but Courage goalkeeper Katelyn Rowland made a diving save. Washington forward Cheyna Williams hit the woodwork on a header attempt in stoppage time of the second half. Washington outshot Carolina 11-10 overall, and the Courage put four shots on goal to the Spirit’s three. The Spirit controlled 52.4 percent of possession overall, including 53.8 percent in the first half. U.S. international forward Mallory Pugh led all players for both sides with four total shots as she, Argentine international midfielder Estefanía Banini and Cheyna Williams each put one on net for the Spirit. Rookie midfielder Meggie Dougherty Howard led Washington in passing for a second straight game, making 34 of her team-high 44 total passes on the attacking side of the field. Banini and Pugh were close behind with 43 passes each, making 35 and 34 respectively, in the opposing half. Defensively, Canadian international goalkeeper Stephanie Labbé notched three saves in four opportunities. Defender Caprice Dydasco led Washington with seven tackles, while Canadian international center back Shelina Zadorsky and midfielder Tori Huster tied for the team lead with four clearances. Kallman’s four interceptions were also a team high.